This design of floating, intersecting circles was created by Frank Lloyd Wright for a rug in a private residence. Luckily, it wound up at Taliesin, so we can all enjoy it. The concrete blocks of the famed Ennis House in Los Angeles provide inspiration for this card case. 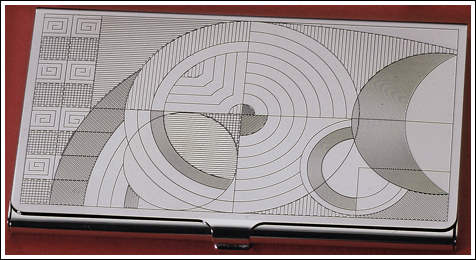 The silver plate card cases measure 3-3/4” X 2-1/4” and holds standard American business cards. What a great gift for the architect or designer in your life.